Now this may shock some of you, the few that wander in on occasion, but anyone that knows me is aware that I can’t drive. More specifically, I don’t have a license. I am 24. Thankfully, for the majority of the time it has been more of an annoyance than a problem. In highschool when my friends were learning to drive, I didn’t have much of a desire. I also didn’t have much money. I lived right by my school and worked a mere 10 minute walk away. The bus would take me to school and my mom or sister would usually take me to work. And if I didn’t have a ride, I walked. Going to Pitt, my ID worked as a bus pass and I used it daily. There were some places I couldn’t go, and I had to make sure I was home before the busses stopped running, but it wasn’t too big of a deal. The grocery store was highly annoying, I’d have to make sure to limit my purchases and riding a packed bus with even just three bags of stuff was hella annoying. I could even get almost all the way to my mom’s house through a combination of the bus and T, just so long as someone could pick me up at the mall. Of course I had to leave 2+ hours before I wanted to get there, but mostly just a (major) annoyance. Through all of this, the lack of a car was the real factor. I had no car, so I had no reason to learn. I also had no one to teach me, unless I wanted to make the 4 hour round trip to my mom’s. Last April, I started dating Keith. I don’t remember any specific conversation, but at some point, he offered to teach me to drive. So at the ripe age of 23, I went and got my permit. The learning has been a little slow. Living in Monroeville has been interesting in terms of driving. There are essentially zero residential streets. My first lesson was in an empty parking lot, my second lesson was in the connected lots of building complexes. Thankfully, Keith hasn’t babied me at all, so we’ve moved along pretty quickly. In the fall, I drove from Gibsonia to Monroeville on the turnpike and was mildly traumatized. All of my driving had been in the 30-45mph range so having to go that fast for that long really flustered me. I didn’t get back into the driver’s seat until spring. We’ve amped up my driving though as my permit expires in June. I will get it renewed, but I 100% have to have my license by the end of August. So with August as my end-goal, I’ve done more than just drive to the grocery store. A few weeks ago I drove from the Monroeville Mall to the Waterfront. I had never been on the parkway before or through a tunnel or across a bridge. I was insanely nervous, but I did it. According to Keith, my two issues are that I am entirely too nervous (I can’t help it! Cars are scary!) and that I sometimes take to long to make decisions (which I think will just take practice.) He said aside from those two things and parking, he thinks I should be able to pass my test. So today we headed out for my first actual parking lesson. 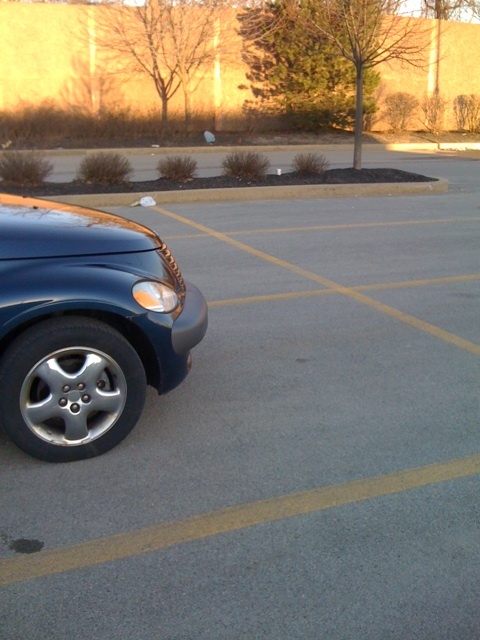 Typically, when I drive I park far away so that I’m not next to anyone. At home, our parking lot is smaller, so that’s not always possible, so it takes me forever and a day to park. We drove up to Gateway High School, trying to see if they had a parallel parking thing (which I don’t think they did?) and came across a giant empty lot. Deciding that was good enough, the lesson began. At first I would just pick a spot and pull into it. After a few times, it got so I wasn’t crashing into the imaginary cars next to me and was able to do it pretty smoothly. I excitedly asked if I could drive around the school to look for the parallel parking thing, but Keith said he had one more thing to show me. He then told me to back into a spot. Which didn’t end well. I straightened out and it wasn’t too bad. Then I tried again with some success, but then I started getting flustered and messing up horribly. For whatever reason, it takes me entirely too long to realize which way I need to turn the wheel when I back up. This is SO FRUSTRATING, because whichever way I pick ends up being the wrong way. Sitting here now, I can see it in my mind, but something about being behind the wheel gets me all discombobulated. I may have cried a little in the parking lot, and then Keith showed me a real method as opposed to the messing up and correcting I was trying to do. So we did that for a little bit more and I improved some. I think I need a few more tries before I’m completely comfortable doing that and need to find somewhere to practice parallel parking. Looking back now, I realize I wasn’t even the tiniest bit nervous driving home from the school (which while only a 5 minute drive is huge!) This August driver’s license actually may just happen. Picture was taken 2 months ago, but I still think it’s the hardest part of parking, figuring out how far in you are. Good thing Keith’s car is short so I wasn’t sticking out. Good luck with your practice! And if you guys go to the DMV located in Penn Hills Shopping Plaza, they have a parallel parking space set up for testing. Hopefully that helps!